We’re talking the original Korean version, of course. Apparently Spike Lee has remade it for the American market for some reason. I’m generally not a fan of remakes (with a few notable exceptions) especially where the original is as utterly stunning as Chan-wook Park’s 2003 movie is. 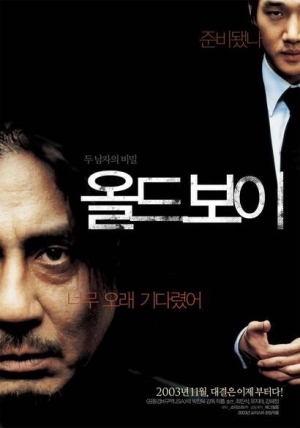 A very healthy 8.4 stars on IMDb, Oldboy comes in at #72 on the IMDb Top 250 and rightly so. Oldboy is the second instalment of The Vengeance Trilogy which starts with Sympathy for Mr. Vengeance and is followed by Sympathy for Lady Vengeance. I’ve not seen the other two films, but they’re now firmly on my List Of Films I Really Ought To Watch. The story follows Oh Dae-Su (Choi Min-sik), an ordinary guy who is kidnapped on the eve of his daughter’s birthday and held captive in solitary confinement for 15 years. One day he’s suddenly released with a wad of money and a cellphone. He sets out on a trail of vengeance to find his captor and work out why he’s been held for so long. And what a tale it is. Park’s tale is an deep, complex exploration of revenge, responsibility and violence. It’s not an easy film to watch at times and will stay with you for a long, long time after it’s over. Very bad things happen to a lot of people (and an unfortunate octopus). The corridor fight scene is one of the best committed to film and is all the more impressive when you find out it was done in one take (albeit shot over the course of three days) and the use of a claw hammer for some… amateur dentistry is both chilling and brilliantly done. The violence in Oldboy is never gratuitous though, unlike a lot of western movies of the same ilk. It’s always there to drive the story onwards. The story itself is beautifully told and unfolds bit by bit, rewarding the viewer with a pay-off which, in the words of a friend, leaves you in need of a good shudder. It’s gripping, mesmerising, masterful stuff, if you’ve got the stomach for it. Highly recommended. Not for the faint-hearted or squeamish though. I’d also like to recommend you listen to the Xanadu Cinema Pleasuredome podcast, specifically Episode 7: Women, Vengeance and Claw Hammers in which Windy & Melissa talk Korean movies with special guest Lex. It’s a joyful thing hearing movie geeks geek out about movies. Love Old Boy! I haven’t seen sympathy for Mr Vengeance but I can highly recommend Lady Vengeance.